Climbers will have over 40 routes (sport and trad) and 20 boulder problems to do in under 7 hours! Grades range from 15 – 30, making the rock rally great practice for the first time rally entrance, and ideal training for the Boven Rock Rally which is a little over a month away. Prizes for the best dressed!! The Gravity Festival started 10 years ago as a gathering of white water enthusiasts and has gradually grown into a multi-discipline festival of adventure sports……….So this is your opportunity – to gather with a bunch of other adventurers to play and party together for the weekend in one of South Africa’s little adventure gems. 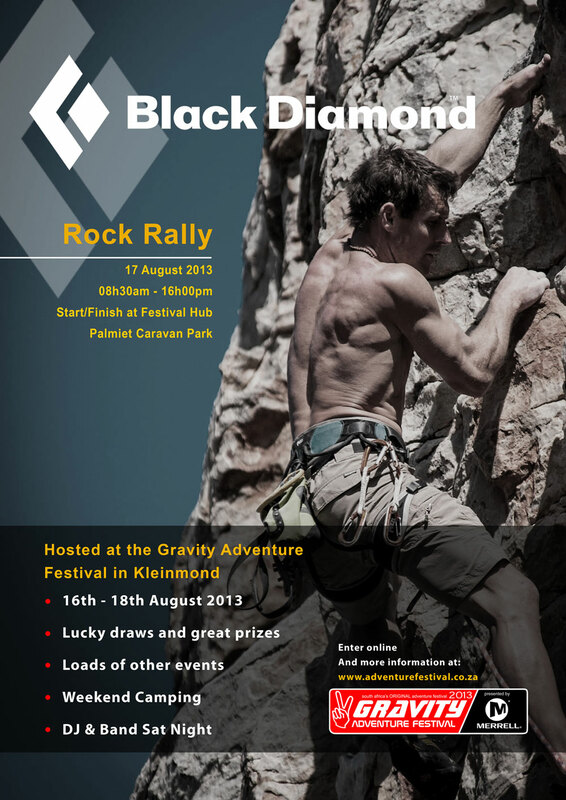 Entrants will gather at the Black Diamond Gazebo (Fairy Glen Campsite) @ 8:30 for the briefing. 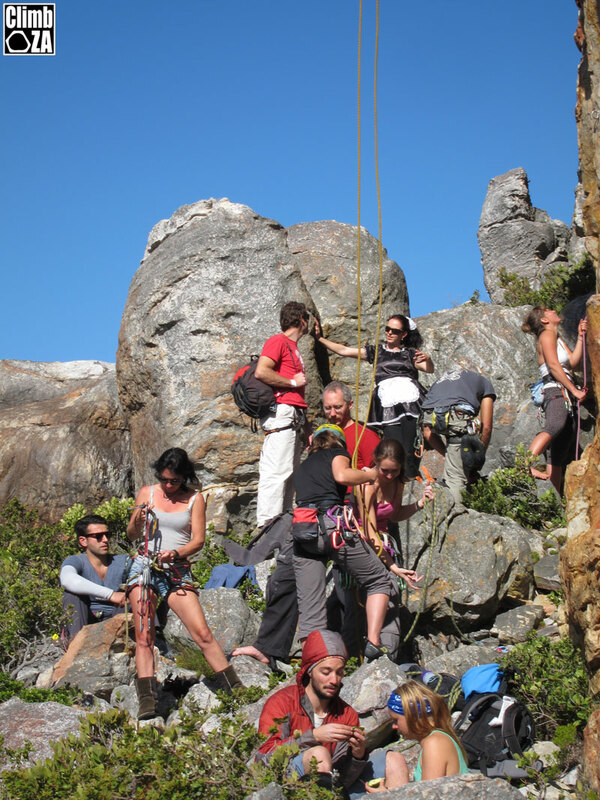 A gathering of all levels and ages of climbers to enjoy the best that Kleinmond has to offer – Sport, Trad or Bouldering – followed by a party of note on the banks of the Palmiet estuary. There are over 40+ routes and 20 boulder problems to be climbed in 7½ hours, making this Rally great practice for first time rally entrance, and ideal training for Boven Rally little over a month later. Scoring will be handicapped by ability, but more details to follow. ***This is a team event therefore entrants will have to partner up. There can be either, male, female or mixed teams competing. Spot prizes: There will be spot prizes given out at the end of the event for the best dressed couple; the most impressive send of the day; the most encouraging spirit of the day – and anything else that the organizers deem fit ! Spot prizes supplied by RAM Mountaineering. 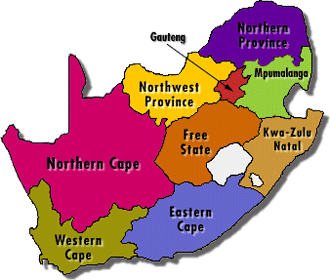 Please Note: All participants are expected to be self sufficient, both regarding gear and refreshments. The use of a helmet is highly recommended while climbing and belaying. 1. Climbers are expected to safely climb as many routes, as hard as they can manage. 2. Only teams of 2 compete in this event. ONLY they may belay each other. 3. The team members do not need to complete the same amount of routes. 4. Each route may be climbed only once on sport and once on trad per climber. 5. Only routes lead from the bottom to the top without falling or resting on the rope/gear will count towards the number of completed routes. 6. No top roping will be allowed to count towards points in the competition. 7. Climbers have 7½ hours to complete the climbs, for every minute that a team arrives after the cut-off time; 10 points will be deducted from each climber’s individual scores. 8. Climbers caught littering at crags, including cigarette butts, will be penalized heavily. 9. This competition is based on an honesty system. The chief reserves the right to disqualify teams guilty of “rule bending” in any way. He will also have the rights to alter handicaps or scores when and if he suspects foul play, or for other purposes. His decision will be final. 10. Every sport climber must tie in directly into their harness with a figure of 8, a backed-up bowline or other recognized safety knot every time they start climbing. 11. For your own safety: Every bolt on a route must be clipped. Standard procedures using both top anchors must be followed for lowering off every route. This is done at your own risk. 13. Bouldering: Each contestant must have a spotter and at least 1 crash pad for protection when attempting routes. 14. Every climber MUST sign an indemnity form before the race starts. Climbing activities are done at your own risk. * The team members will do their own scoring based on an honesty system. * 1 bonus points will also be awarded for routes flashed or on-sighted on the day. This will benefit climbers that do not climb at this venue frequently. Just a note to the above, scoring has not been settled yet, and so we will post an update as soon as we have one settled- who knows, maybe we use a scoring system that encourages premeditation and planning!